Entertainers top the charts on a study of Twitter influence. According to the phone manufacturer, INQ, the most influential people on Twitter are mostly entertainers and celebrity sports people. 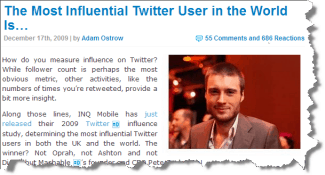 Fourteen of the Top 20 influencers are entertainers and well-known sporting legends. There are only two business people in the list – Pete Cashmore and Biz Stone. Pete is the founder of the social media site, Mashable, and Biz is the co-founder of Twitter. Remarkably, they sit amongst a list of celebrities and entertainers who not only have large numbers of followers, but also get re-tweeted a great deal, who make large numbers of posts themselves and who are referred to many times over by other Twitter users. Now, that’s understandable for people like Stephen Fry or Lance Armstrong…but two business people? Really? Why is that? Well, take a look at the way Pete Cashmore and Biz Stone do their Tweets and their blogs. They are not, what you might say is “business-like”. Gone are the formalities of business. Gone is the business-speak. Gone is the traditional. Instead, these two guys are, well, entertaining. And therein lies a lesson. Both of these Twitter superstars are informative, helpful and clearly experts in their fields. But the way they write, the kind of things they say can make you smile or surprised or pleased in some way. Entertainment is all about triggering emotions and that’s what Pete Cashmore and Biz Stone do. So, if you want your business to be noticed online and to have real influence, this study should be a lesson worth thinking about. It’s time to say goodbye to being like a business and time to say hello to being entertaining. The online generation no longer wants formal, stuffy, business-like ways of doing things. Entertainment is a prime motivator and businesses that ignore that are likely to do less well in the coming years than those which focus on having fun and triggering emotions in their audiences.